Early morning, I was checking in to my American Airlines flight to Austin at one of those kiosks and groggily pressing thru the options on the touch screen, when I got jolted out of my half asleep stupor by what I saw. The screen that would let me check in my bag said that first two bags were free for me (I had only one) but the third one would cost $150 !!! $150! That is nearly the price for a round trip domestic flight!! They really, really do not want you to bring in a third bag, I mused. 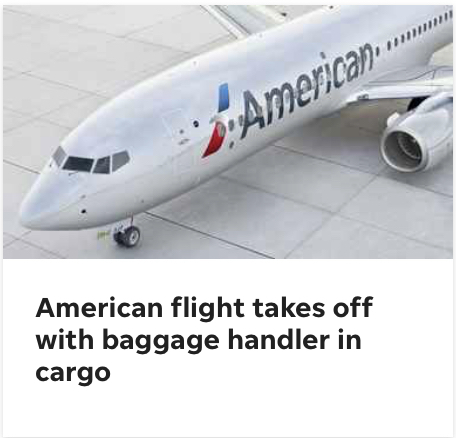 Later, I was wondering about something… ever since the regime of pay-for-checked-in-bag came, I assume the cargo load must have gone down. But the planes are still the same. So, what do they do with the extra space? (You will be surprised how such non-consequential questions can keep me worried 🙂 ). In any case, finally I settled down in my airplane seat and opened up the USA Today newspaper on my iPad. And right on the first page was this news…. I think I got my answer! !